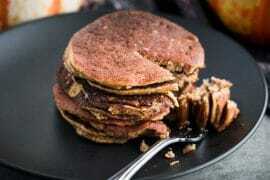 If you’re looking for new keto breakfast ideas, look no further. 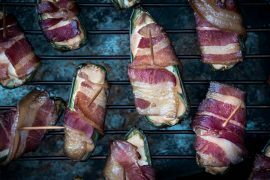 Not only is this low carb egg in a nest recipe easy to whip up, but the flavors are also a little different than the standard defaults. 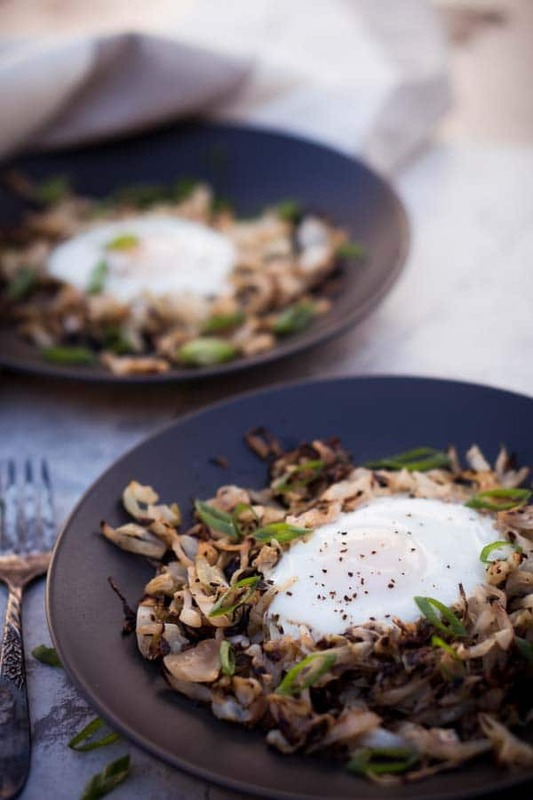 Braised cabbage and eggs are one of my favorite early morning meals. 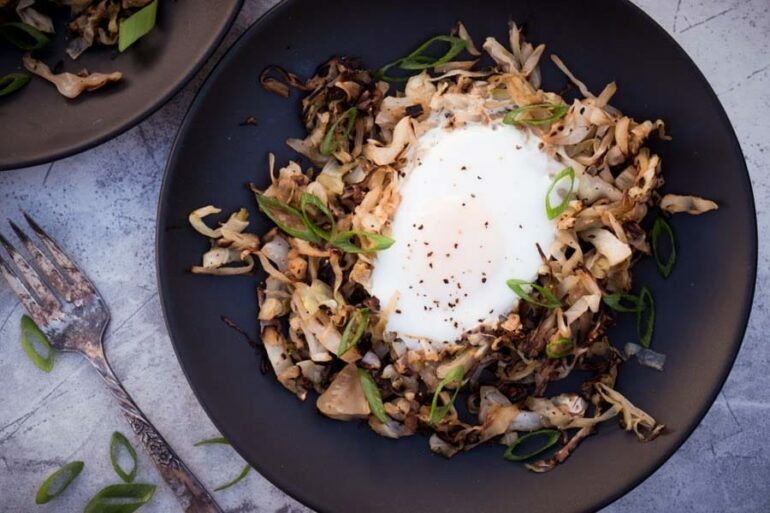 Cabbage and eggs might strike you as an odd combo if you’ve never tried it, but it’s incredibly satisfying. 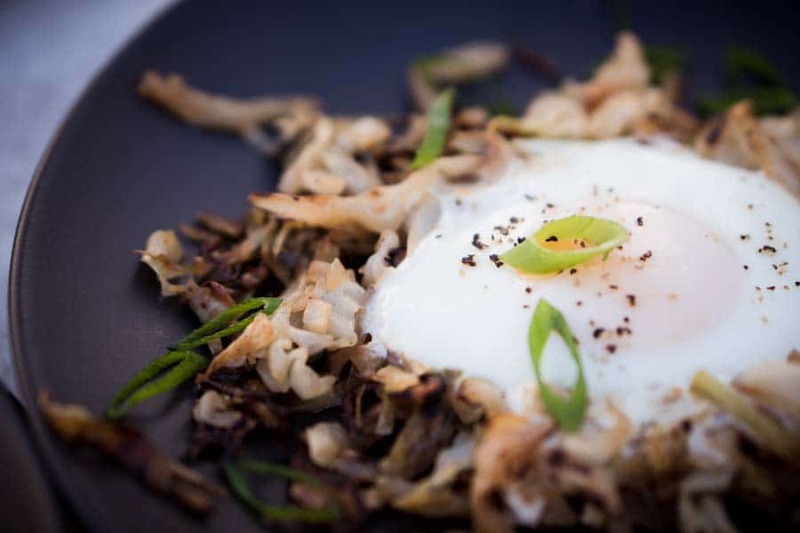 Braised cabbage is killer by itself, but sometimes things are just better with an egg on top. 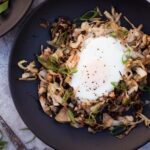 Cabbage is an incredibly versatile veggie, so you can use a wide variety of flavors to give this keto breakfast your unique spin. If you have leftover egg roll in a bowl, you could even use that as the base instead of braised cabbage. Get creative! Egg in a nest recipes typically includes a starchy or bready “nest” for the egg. Toad in the hole, for example, is an egg fried in the center of a piece of toast. And we’ve all seen those carb-loaded hash brown nests. 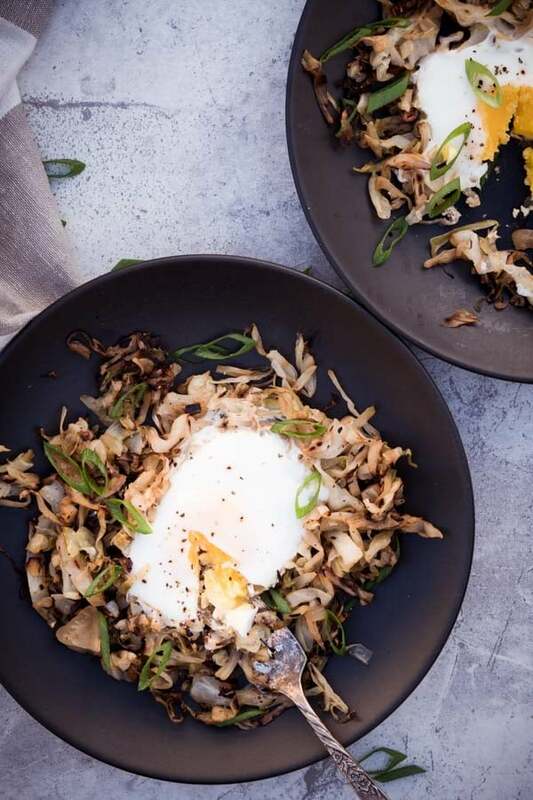 With only 3.3 net carbs per 100 grams, cabbage makes a perfect low carb nest for the egg to cook. The low carb egg in a nest starts off with shredded or thinly sliced lettuce. 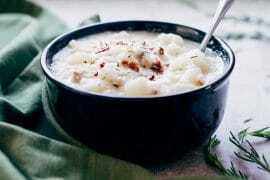 Just a teaspoon of ghee in a frying pan is enough to coat the cabbage while it fries. Add a little salt and sauté the cabbage until it begins to brown; this will only take a few minutes on medium-high heat. Once the cabbage has browned to your liking, add the apple cider vinegar, pepper, and mix it all in the pan. Gather the cabbage in little mounds, then using the back of a spoon, make indentations to create space for the egg. 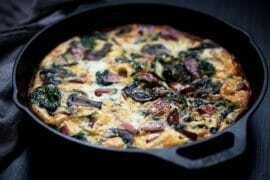 Crack an egg into each well in the cabbage mounds, cover pan, and reduce heat to low-medium. The egg will steam with the pan covered, so keep an eye on it to make sure the egg is cooks to your liking. At about 2 minutes, the white will set, and the yolk will start to firm. If you like runny yolks, check the low carb egg in a nest at about 1.5 minutes. If you enjoy harder yolks, test the egg at about 2.5 minutes. 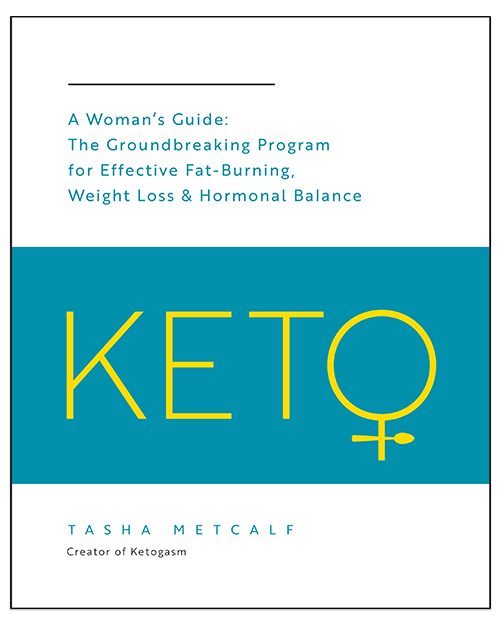 Now season your new favorite keto breakfast with salt and pepper! Enjoy! 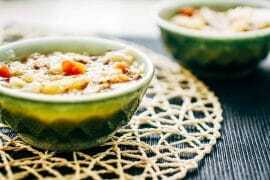 Braised cabbage makes an excellent low carb nest for your egg. Melt ghee in a large frying pan that has a fitted lid over medium-high heat. Add cabbage and salt. Toss with the melted ghee. Continue cooking over medium-high heat until the cabbage browns, about 3-4 minutes. Mix in apple cider vinegar and pepper. 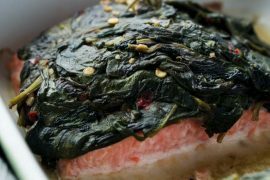 Gather cabbage into two small mounds. Using the back of a spoon, form a well in each mound to create space for the eggs. Crack an egg into each indentation in the cabbage. Reduce the heat to low-medium and cook until whites of egg firm and yolk reaches desired consistency. Approximately 1.5 minutes for runny yolk, 2 minutes for slightly firm yolk, 2.5 minutes for solid yolk. Lettuce? Typo, I assume. I will come back to rate it after I make it for tomorrow’s breakfast. I think it might need a little more ghee. Other than that we enjoyed it.